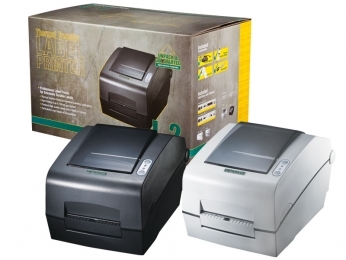 With the L-2 we offer you an especially powerful label printer. Thermal transfer printing makes labels extremely durable and is suitable even for demanding applications e.g. at high temperatures, outdoors or for long-lasting labels. Its fast microprocessor and generous memory size ensure that even complex labels e.g. with pictures, 2D bar codes or illustrations, or particularly long labels are printed without delay. Various connectivity options and compatibility with Zebra and Eltron label printers ensure easy integration into existing systems. The L-2 is a very powerful printer for various professional applications, such as in logistics, production or retail. Although it features a very compact housing, it is able to hold a large stock of consumables. Transfer ribbons of up to 110 mm diameter and label rolls of up to 130 mm result in fewer roll changes compared to similar desktop printers that need up to four times as many. For you this means improved ergonomics and efficiency. The 32-bit microprocessor and 8MB RAM allow particularly fast processing of all print data. Its 8 dots/mm 203dpi resolution produces perfect and pin-sharp printouts of bar codes, text and logos. A 12 dots/mm 300 dpi version that offers even better printing quality of high-resolution bar codes, pictures and illustrations is optionally available. Furthermore, the L-2 has additional character sets so you have an extra wide choice of fonts. To ensure high compatibility with all software applications and systems, the printer supports all three standard printer-programming languages for label printing. It supports SLSC Samsung Command Set, as well as EPL Eltron Programming Language and ZPL Zebra Programming Language. These features allow the printer to simultaneously process all major programming languages for label printing. With the L-2, you always have a factory-installed parallel, serial and USB interface available. The printer recognises automatically which interface is in use. Optionally, you can get the L-2 with an integrated Ethernet print server. This version also offers a serial and USB interface, guaranteeing you a wide range of applications. For easily creating wider labels, the L-2 processes roll widths of up to 112 mm - and of course also narrower label rolls. The roll guide is of course available as standard and can be set variably for all label widths. Replacement of consumables is completed in a matter of seconds without threading just open the lid, insert the roll and close the lid again. The printer reliably recognises different label sizes and forms both round or oval labels using the black-mark and gap sensor. In combination with the printer, Metapace provides a set of powerful drivers that offer versatile professional functions. Label alignment and scaling can be adjusted individually. User character sets can also be loaded into the printer memory, which means only text data need to be transferred for printouts. This naturally speeds up the entire printing process significantly.